This one is obviously a must. 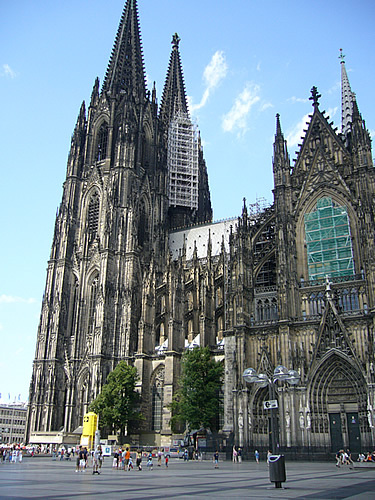 The Cathedral is Cologne’s most prominent and famous landmark. Construction began in the 13th century but was not completed entirely until the 19th century. Cologne Cathedral is one the most important monuments of the Roman Catholic church and one of the largest cathedrals in the world by various standards. It is a Gothic church and contains the Shrine of the Three Kings, which holds the remains of the biblical Three Wise Men. Entrance to the church itself is free, guided tours cost five or six Euros (also available in English). 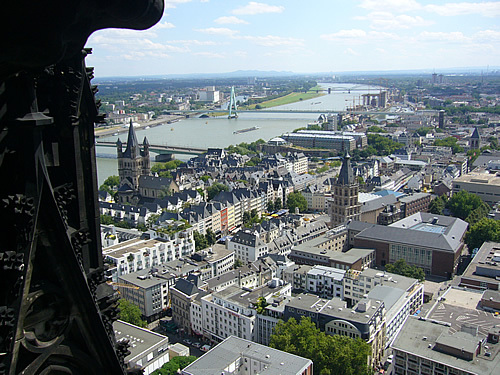 The Rhine River is Germany’s largest one and only a stone’s throw away from the Cathedral. Taking a stroll along the river is a great way to start exploring the city as you will pass a lot of typical architecture. The railroad bridge nearby is connected to an interesting custom as well: you will see a lot of locks attached to the wired fence separating railroad tracks from the pedestrian walkway. These are placed there by lovers who then throw the key into the river to vow eternal love. 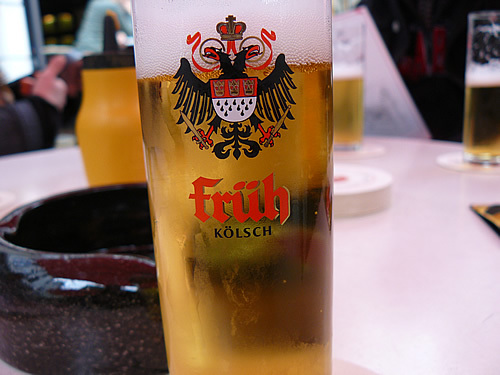 “Kölsch” is the beer of Cologne, and not only because Cologne is the place where this kind of brew originated. Until today there is a law that only this type of beer brewed in Cologne may be called Kölsch. If it was brewed elsewhere it may not carry that title. Kölsch is a bright and clear brew, which is rather sweet than bitter. You can have one at any of the local pubs, restaurants or breweries. Have a break and enjoy a refreshing Kölsch beer! This should be put as a separate activity since it will easily take you two hours altogether to climb the more than 500 steps to the top of the tower, take a good look around and then begin your descent. You should be physically fit to do the climb, because it is quite steep and there are no elevators of course. From the top of the tower you are granted a great view over the entire city and surrounding area. You will also pass through the bell chamber on your way up. Entrance to the tower is two and half Euros. Hohe Straße means High Street and is Cologne’s most frequented shopping street. Here you can find anything from cheap souvenirs to expensive jewellery. Or you can simply move with the waves of pedestrians passing through, while listening to the street musicians who usually play here in vast numbers. I spent the summer 2010 in Germany with my 15 year old son. We live in Brooklyn, NY and when he entered high school ( a newly formed high school of engineering, archictecture and technology I was happy he had found a school that would nurture his interest in Engineering which is what he said he wanted to do from he was four years old (he saw a picture of Ernie of Sesame Street fame building a bridge of blocks in a beginning Sesame Street Dictionary under the word Engineer. He asked me what it the word meant and when I read it to him, he stated he wanted to be an engineer. Well lo and behold he got into this high school in Brooklyn NY where he is doing things that if he apply himself, he could be a the next Roebling or Gehry or any major engineer because if he knew at the age of 4 that he wants to be an engineer then he is ahead of the pack. The offer 5 foreign language at his school. He chose German. For the summer of 2010. thought we should visit Germany so that he could immerse himself in the language. I am a single parent, so I did not think we would be able to afford such an ambitious trip for both of us. Luckilly, we have a friend who lives in Wuppertal who made it possible for us to stay at his home on Elsasser Street. We arrived in Wuppertal on July 1, 2010. What an experience! This the best place to visit for anyone who is interested in pursuing engineering. We visited so many places and museums that exposed my son to the engineering and architectual genius of the Germans. We can’t wait to visit again in 2011. This time, however, we would like to meet more germans, especially Germans of African ancestry as we are Black New Yorkers by way of Jamica, west indies. We love Germany and want to emulate the disciplne you Germans display and hopefully inspire others to visit your wonderful countr. My name is Ms. Laura Radilla and I am a middle school teacher in Campbell, California. I am taking the liberty to post a comment on your blog because I was unable to find a way to message you. Some of our students are learning about Germany in an Apprenticeship called German Culture Blog “Das Blog”. I was thinking that it would be great for them to hear from someone (Adult) that is creating a project (blog) similar as the one they are developing. Do you think this would be feasible and something you would be interested in doing? I know they would greatly appreciate it and could use some motivation. Glad to see you on my blog!